LINCOLN, Neb. 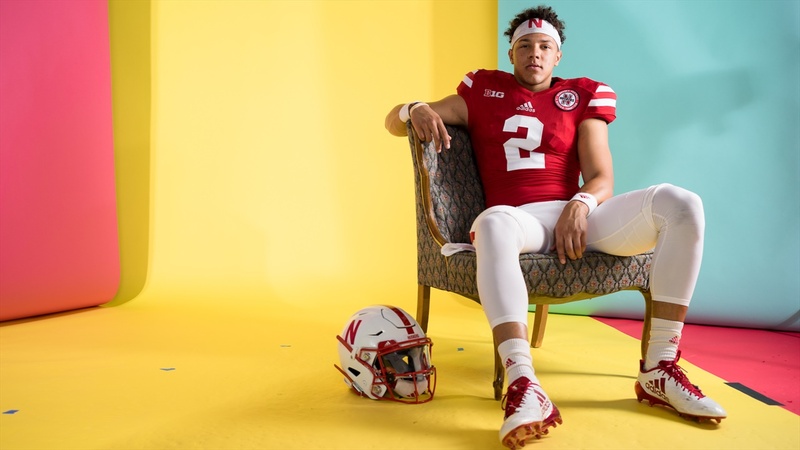 -- Adrian Martinez couldn't help but laugh at his teammates heckling him before Sunday's Nebraska Football Road Race. Camped out in front of a trailer serving soft drinks, Martinez signed autograph after autograph and took picture after picture. "Just a reminder that he's never played a snap of college football," sophomore wide receiver JD Spielman called out. Martinez grinned. The true freshman quarterback from Fresno, Calif., opted to enroll early at Nebraska, trading in his final semester of high school to get a jump start with the Huskers. While he's had an opportunity to acclimate to college football, he also knows he has plenty to prove. That's why Sunday was so surreal for Martinez, but it wasn't just Sunday. He's also been stopped many times out and about since arriving in Lincoln. "It's definetly a humbling experience because I haven't accomplished anything," Martinez told Hail Varsity. "I think I'm pretty undeserving of any attention right now. To be honest, I haven't done anything on the field that's worth anything but I'm thankful. Husker fans are great and they definitely make me feel good." While Martinez appreciates the love and attention, he also knows fans are eager to learn who will be Nebraska's starting quarterback this fall. Coach Scott Frost and quarterbacks coach Mario Verduzco have been clear that the competition will go well into fall camp, so it's anyone's job to win at this point. I think I'm pretty undeserving of any attention right now. To be honest, I haven't done anything on the field that's worth anything but I'm thankful. And while that could divide even the best of quarterbacks rooms, it has done the opposite for the Huskers. Martinez, redshirt freshman Tristan Gebbia, freshman Matt Masker, and sophomores Noah Vedral and Andrew Bunch have formed a tight bond. So much so, Martinez could hardly get through an interview without having a Sharpie pen tossed at his chest to distract him. As Martinez apologized through a slight grin, his fellow quarterbacks ran off laughing. "We're pretty good buddies and we give each other a hard time," Martinez said. "We're just trying to get the best out of each other, and this fall camp is going to be big for the quarterback competition obviously. We just want to see the best of each other, though. When I'm on the sideline, I watching Bunch, Noah or Tristan. "I want to see the offense be successful and we're just trying to make the offense the best it can be." Part of creating the best offense means listening and learning from Verduzco. It also means a four-hour quarterback test that's comparable to the ACT. It's broken into four parts, and each section has a time limit. A blue or black pen is required, and it is entirely written. Considering it hasn't been all that long since Martinez took the actual ACT, he has an interesting perspective on the whole thing. "It's very difficult," Martinez said. "I think we all prepared for it well, and it's helped us all learn the offense and the schemes. It takes four hours to complete, so I'd say it's even harder than the ACT. It's the hardest test I've taken." Better get used to it, though. Verduzco will administer the test again in the fall, and then they'll start the process over again next year. It's not all work for the quarterbacks, though. Verduzco — who Martinez says brings a "different type of energy" ever day — makes sure his quaterbacks kick back and enjoy life, too. That includes all the Italian food one can eat. And Verduzco's known for his cooking skills, specifically his Italian meatballs. "It's pretty spectacular. I'll just say that," Martinez said. "It's the best thing ever, and specifically the best Italian food I've ever had." Verduzco is known for more than his food and tests, though. He's just as much a part of the quarterbacks bonding, and that has everything to do with how he cares for the young men in his room. "Coach Verduzco is going to push us, but he loves us," Martinez said. "He wants the best for us and he's going to root us on. He's our biggest fan. He's going to be real with us and we know that. "I'm truly thankful and I see him as another father figure." This is all new for a guy like Martinez. Autographs, photos with fans and settling into college life will take some time. He's finding his way, especially with the help of his teammates and coach. A quarterback competition may be brewing, but there's a common goal between Martinez and his teammates. And for better, worse and plenty of heckling, they're in it together. "We have fun and we go fast and we're going to score a lot of points," Martinez said. "Coach Frost wants to win some ball games and we're going to do what we can to make that happen."